Scripture taken from the HOLY BIBLE, NEW INTERNATIONAL VERSION Copyright © 1973, 1978, 1984 by International Bible Society . Used by permission. For those who prefer scripture readings in other translations of the Holy Bible please refer to the original greek language texts for clarification. The Spirit baptism which every believer in Jesus experiences when Christ is received by faith is that same Spirit baptism which was promised. The scripture speaking of being baptized “by” the Holy Spirit or “with” the Holy Spirit is referring to the same experience: Holy Spirit immersion into Christ. In the original greek language, both words are εν (en), which has the most common translation of “in” but may also be translated as “by” or “with”. It is the one Spirit baptism which immerses all believers into Christ which is received by saving faith in Jesus Christ. Ephesians 4:4-6 (NIV): There is one body, and one Spirit, even as ye are called in one hope of your calling; One Lord, one faith, one baptism, One God and Father of all, who is above all, and through all, and in you all. Galatians 3:26-27 (NIV): You are all sons of God through faith in Christ Jesus, for all of you who were baptized into Christ have clothed yourselves with Christ. Romans 6:3-4 (NIV): Or don’t you know that all of us who were baptized into Christ Jesus were baptized into his death? We were therefore buried with him through baptism into death in order that, just as Christ was raised from the dead through the glory of the Father, we too may live a new life. A common misconception is that Acts chapter 1 verses 5 and 8 are speaking of the same thing. However, these, in fact, are two different experiences. The first of being saved by the baptism of the Holy Spirit while the second refers to receiving the Holy Spirit. Although the experience may be simultaneous at times, it is not always so. Ephesians were Holy Spirit baptized into Christ when they received Him by faith. This was before the Holy Spirit came on them to fill them. Acts 19:1-7 (NIV): While Apollos was at Corinth, Paul took the road through the interior and arrived at Ephesus. There he found some disciples and asked them, “Did you receive the Holy Spirit when you believed?” They answered, “No, we have not even heard that there is a Holy Spirit.” So Paul asked, “Then what baptism did you receive?” “John’s baptism,” they replied. Paul said, “John’s baptism was a baptism of repentance. He told the people to believe in the one coming after him, that is, in Jesus.” On hearing this, they were baptized into the name of the Lord Jesus. When Paul placed his hands on them, the Holy Spirit came on them, and they spoke in tongues and prophesied. There were about twelve men in all. Samaritans were Holy Spirit baptized into Christ when they received Him by faith. This was before they received Holy Spirit filling. Acts 8:14-17 (NIV): When the apostles in Jerusalem heard that Samaria had accepted the word of God, they sent Peter and John to them. When they arrived, they prayed for them that they might receive the Holy Spirit, because the Holy Spirit had not yet come upon any of them; they had simply been baptized into the name of the Lord Jesus. Then Peter and John placed their hands on them, and they received the Holy Spirit. It is understood that the household of Cornelius was Holy Spirit baptized into Christ and received Holy Spirit filling when they received Jesus. Afterwards they were water baptized. Acts 10:44-48 (NIV): While Peter was still speaking these words, the Holy Spirit came on all who heard the message. The circumcised believers who had come with Peter were astonished that the gift of the Holy Spirit had been poured out even on the Gentiles. For they heard them speaking in tongues and praising God. Then Peter said, “Can anyone keep these people from being baptized with water? They have received the Holy Spirit just as we have.” So he ordered that they be baptized in the name of Jesus Christ. Then they asked Peter to stay with them for a few days. Notice that they were to be “baptized IN the name of Jesus Christ” not “baptized INTO…” This is because water was the element of baptism which Peter was speaking in the authority of Jesus Christ to be performed. In the original greek language, the word “in” is εν (en). The word “into” is εις (eis). These prepositions are different. Just as when Peter preached the gospel to the Gentiles, it is to those whom God grants repentance unto eternal life that the gift of Holy Spirit baptism is given. It is witnessed that the baptism of the Holy Spirit is received at the initial repentance of those who believe in the Lord Jesus Christ. Holy Spirit filling has given boldness to believers to testify of the word of God and of Jesus. Acts 4:8-10 (NIV): Then Peter, filled with the Holy Spirit, said to them: “Rulers and elders of the people! If we are being called to account today for an act of kindness shown to a cripple and are asked how he was healed, then know this, you and all the people of Israel: It is by the name of Jesus Christ of Nazareth, whom you crucified but whom God raised from the dead, that this man stands before you healed. Acts 4:31 (NIV): After they prayed, the place where they were meeting was shaken. And they were all filled with the Holy Spirit and spoke the word of God boldly. Those in the Upper Room were filled with the Spirit when they were Holy Spirit baptized into Christ on Pentecost. Acts 1:5 (NIV): For John baptized with water, but in a few days you will be baptized with the Holy Spirit. Acts 2:1-4 (NIV): When the day of Pentecost came, they were all together in one place. Suddenly a sound like the blowing of a violent wind came from heaven and filled the whole house where they were sitting. They saw what seemed to be tongues of fire that separated and came to rest on each of them. All of them were filled with the Holy Spirit and began to speak in other tongues as the Spirit enabled them. Again, although on this occasion, these experiences were simultaneous, they are not the same. Spirit baptism is not synonymous with receiving the Spirit nor with being filled with the Spirit. The Apostle Paul was Holy Spirit baptized into Christ when he received Jesus by faith on the road to Damascus. It was later that Paul was filled with the Holy Spirit. Although Paul could and did speak in tongues at a later time, note that there is no mention of Paul speaking in tongues here at this time nor prior. To conclude that Paul must have spoken in tongues here is presumption and not a conclusion based on what Scripture has said but where Scripture is silent. Therefore, speaking in tongues is not always evidenced in Spirit baptism as seen in many passages of Scripture. Nor is tongue speaking always witnessed when Spirit filling is received as these verses demonstrate. The initial evidence of Paul’s receiving his first filling with the Holy Spirit was that his vision was healed. All these Scriptures show the Biblical pattern for Spirit baptism and receiving Spirit filling which has not changed at all since the early days of the Apostles. The description of Holy Spirit baptism in the New Testament epistles matches the experiences viewed in the book of Acts. 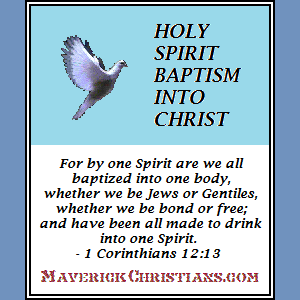 The one Holy Spirit baptism is received upon acceptance of Christ. The indwelling of the Holy Spirit begins at that time. There has never been any exception to this. Various times of being filled with the Holy Spirit are possible to occur during or after the receiving Christ as Savior. Spirit filling should be sought for and encouraged among believers. The first time someone is filled with the Spirit is frequently referred to as having received the Holy Spirit. Care should be taken not to confuse the receiving of Holy Spirit filling as being the baptism of the Holy Spirit. Although receiving Holy Spirit filling may be a separate experience subsequential to salvation, baptism in the Holy Spirit has never been. The speaking in tongues is not necessarily the initial evidence of the baptism of the Holy Spirit nor of Spirit filling. 1. Be indwelt with God’s Spirit through receiving the baptism of the Holy Spirit by repentant faith, accepting Jesus as Savior. Acts 2:38 (NIV): Peter replied, “Repent and be baptized, every one of you, in the name of Jesus Christ for the forgiveness of your sins. And you will receive the gift of the Holy Spirit. Romans 8:9 (NIV): You, however, are controlled not by the sinful nature but by the Spirit, if the Spirit of God lives in you. And if anyone does not have the Spirit of Christ, he does not belong to Christ. 2. Receive the Holy Spirit, that is to say, be filled with the Holy Spirit in a yielded life to Christ. Ephesians 5:18 (NIV): Do not get drunk on wine, which leads to debauchery. Instead, be filled with the Spirit. 3. Let the fruit of the Spirit be evident in your life. Galatians 5:22-23 (NIV): But the fruit of the Spirit is love, joy, peace, patience, kindness, goodness, faithfulness, gentleness and self-control. Against such things there is no law. 4. Be empowered witnesses of Christ.